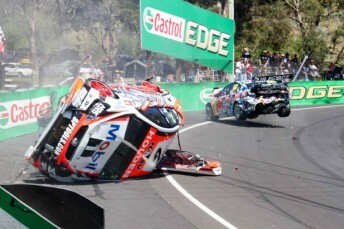 The two-meeting old Holden Racing Team Commodore crashed heavily by Warren Luff at Bathurst will not race again this season, says Garth Tander. The entry was withdrawn from the Supercheap Auto Bathurst 1000 on Saturday after a brake failure saw Luff spin into the tyre wall at Griffins Bend and roll. The incident ended an already difficult weekend for the team that had seen major repair work on Thursday night following a crash in practice from Tander. The chassis only made its debut at Sydney Motorsport Park in late August and had finished third in last month’s Sandown 500. It has now been retired to the corner of the HRT workshop while the team completes the rest of the season, to be repaired over the non-racing summer months. Tander and Luff will switch to the team’s spare chassis for the Castrol Edge Gold Coast 600, which had sat as a shell after being repaired from its own crash in Sydney at the hands of Tim Slade. Walkinshaw Racing is also this week repairing the car that Slade crashed at Reid Park during the eight-hour Bathurst epic. “The car that we had at Bathurst that was only two race meetings old is now sitting on the scrap heap,” said Tander in a Holden Motorsport video. “I’m not sure if that car will run again, it’s pretty bad. Tander says that he will have to be mindful of the team’s ‘depleted’ chassis situation when taking to the punishing streets of Surfers Paradise. “The car that we’ll be running will be every bit as good as the car prior to the crash at Bathurst,” he said. “It’s got all the same equipment in it, all the same upgrades that we’ve been bringing to all of our cars throughout the course of the year. “The idea is to go up there and go for a couple of race wins, but we need to be mindful of the fact that the stocks are pretty depleted at the moment. While Tander’s crashed car will lay idle, the team has another spare that it says could be activated for Phillip Island, if required.